This kid. Rylee has been coming to baking club for half her life. During this time she has learned how to quickly scan a well-laden potluck table for anything that might contain bacon. She understands the value of second dessert, and the practical economy of sturdy Tupperware. These are life skills not taught in school. I like to imagine her years from now, at university somewhere, organizing potlucks or bringing cupcakes to study meetups. There is something about this simple act of sitting down and eating together, enjoying a good chat and a catchup over a resplendent quantity of home cooked awesomeness. In this era of online connection and real life loneliness, that craving for community can be just as strong as the appetite for the food. Happy 5th Anniversary to our splendid little baking/cooking/potluck/eating club. Thank you to everyone who joins in the ridiculousness and makes this the fabulous group that it is. Thank for you indulging when I throw weird-yet-wonderful themes at you like Bookish Bakes and Full Fat February. Extra thanks to everyone who kept it all going and gave me amazing support when I had to step away. I squeeze you. As a special anniversary event, we have our first road trip. On Sunday, May 27th, we’ll be carpooling our way down to Keremeos for a lavish picnic potluck at the Grist Mill Gardens. Join the Facebook event or email me at pleasebringcake@gmail.com to sign up. Let me know if you can drive or if you’ll need to join a carpool group. Want to know what we ate in April? Our Vegan meetup fell during Earth Week (not planned but still splendid) and was held at Purple Hemp. We learned about why Chris and Elaine started the business nearly a year ago, and about their products and the practitioners offering a variety of health services. Baking club member and whole foods aficionado Victoria was our host for the evening. Here she is introducing us to Purple Hemp’s new smoothie menu. Then we got down to eating. 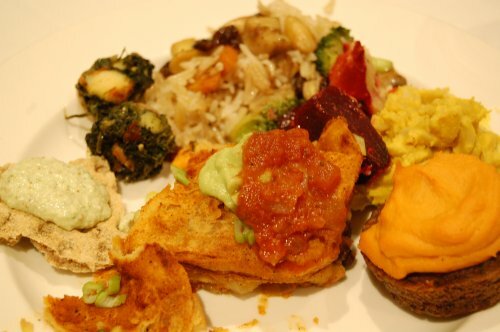 We had salads, we had appies, we had hearty savoury dishes and multiple desserts. It was really a perfectly balanced potluck. I’ve tried to include links to recipes where I have them. For salads, we enjoyed Tania’s Thai inspired coleslaw, Rosemary & Sandy’s Yin & Yang Salad with jalapeno/tahini dressing, and got our lone non-vegan indulgence by way of the cheese in Jean’s Quinoa Taco Salad. I’ve decided that my only way forward with quinoa is with cheese. Same goes for kale. For our Dips & Chips course, we devoured Dorthea’s Rustic Italian Caponata with Belgian Endives and/or popped bean crackers, scooped great chipfuls of Chantelle & Rylee’s Oh She Glows Hummus & Pita Chips, used fresh veggies to load up on Gina’s Roasted Beet Hummus, and sprinkled the works with Laura’s Roasted Chickpeas. We also got to try some of the Okanagan Rawsome Carrot Crisps, which Purple Hemp carries in store. Both a salad and a dipping dish, Jan’s Thai Veggie Wraps with peanut dipping sauce. I didn’t get to try one but they sure looked tasty. Now we need to take a minute to talk about Kim. Who is this woman? After five years of baking club, what do we really know about her? That she makes a mean Schneckenbrot, yes. That she can construct a Battenberg Cake using homemade marzipan, certainly. But three month aged vegan cheese? Did she go to some secret culinary school, like Hogwarts but for kitchen wizards? Fennel Salami (raw dried plums, raw almonds, fennel, balsamic vinegar, cognac, black pepper). Smoked Fermented Cashew Cheese, made using traditional cheese making techniques (ie it takes several MONTHS to make) and cold smoked for 6 hours. All topped off with a zinger of a Quince Paste. It was amazing. I don’t know what else to say. This is no time to stop to break – we have the main courses to attend to! In this case we ladled ourselves helpings of Denise’s Tofu Enchiladas and Karen’s Sweet Potato Chickpea Spinach Coconut Curry from Oh She Glows. Then we ate no less than six desserts. 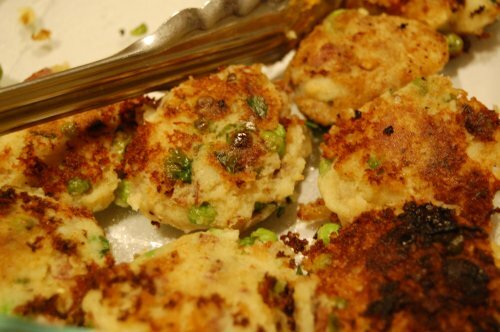 I’m counting Ingrid’s Homemade Aussie Bites as a dessert because they were slightly sweet and would be nice with a cup of tea. We also had slabs of Wendy’s Banana Chocolate Cake (aka Wacky Cake, aka Most Excellent Breakfast Cake). 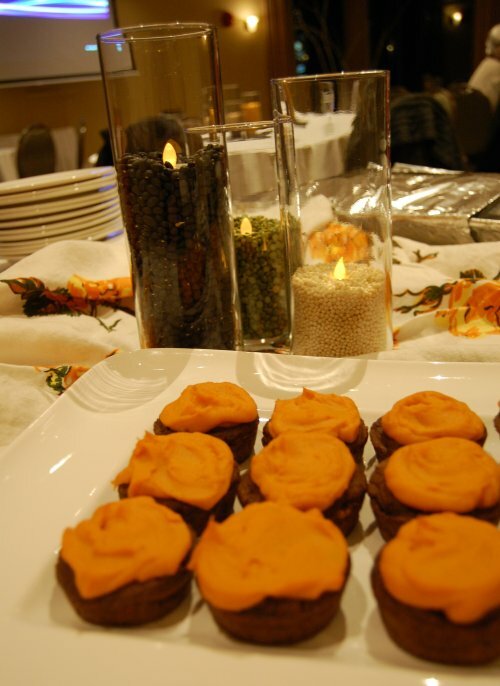 The decadence continued with Victoria’s Chai Spice Chashew Cheesecake and Lory’s Avocado Sweet Potato Brownies. Rylee devoured several of Emily’s Ginger Cookies, and I once again hauled out my old Raw Mango Fruit Tart recipe, which never fails me. I don’t have a formal recipe but I posted a rambling version of a recipe on Instagram. And that’s everything we ate! I hope you’ll save the date for our trip to the Grist Mill. Thanks for being awesome. 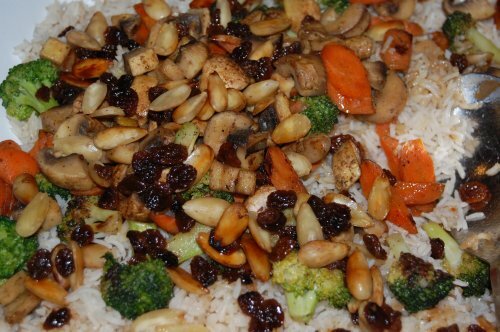 Healthy Potluck – delicious photos! Have you ever wanted to make a recipe because you liked how it sounded? 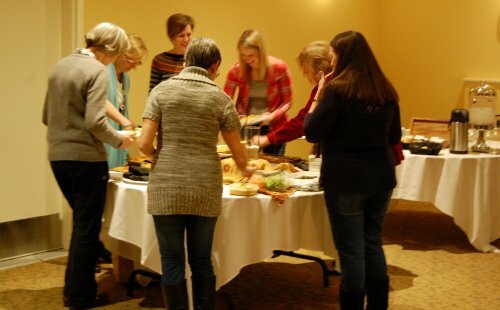 Our January Healthy Potluck and Movie Night was a collection of incredible food, including several dishes that were a delight to say as well as eat. A huge thank you to the lovely Lisa and the Summerland Waterfront Resort for hosting us, with tablecloths and wine glasses and cloth napkins and everything! Thanks for everyone for coming out, bringing delicious food to share, and swaying in your seats to the cuban-inspired music of Chef. I present to you a collection of photos of our goodies. I have gathered up some recipes and will post them next time. Kim S’s Schneckenbrot, aka “Snail Bread.” Not only is it delicious, it’s a very handy thing to yell at someone in order to confuse them. Lori’s Palm Springs Guacamole. Yes, we ate it all. Jan’s South African Bobotie. I had always wanted to try this dish so it was such a treat! 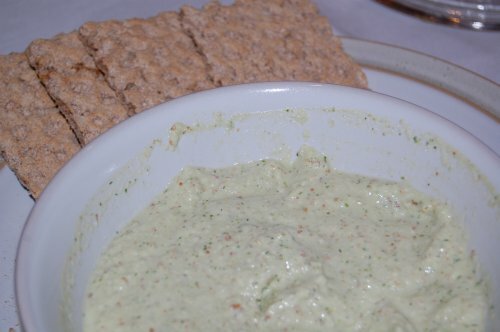 Lori’s Baba Ganoush and veggie chips. Baba Ganoush. Baba. Ganoush. So good. Thai style Veggie and Rice Noodle rolls. Light, healthy, yum. Karen’s “Random Pasta Salad” with olives. Love the name, and loved this salad! You can’t have a healthy potluck without a quinoa and veggie salad! Wendy’s Pumpkin Pear Spice Cake with cream cheese icing. I love that part of why this recipe was healthy is that the icing was not as thick as she usually would make it. Tee hee. A little dessert photo, featuring Chantelle’s Peanut Butter Pie (nom), and Evelyn’s Angel Food Cake with Okanagan Fruit Compote (also very nom). Tina’s Greek Lentil Soup. I have the recipe for this and I will post it next time! Kim L’s Granola Bars. These were lovely – the recipe is John’s but Kim added the flourish with the chocolate chips, which I for one really appreciated, because chocolate. Leslie’s Curry Chilli with Beans. Hearty, healthy, perfect for winter. Jennifer’s Chia Seed Power Donuts, from Oh She Glows. There was chia seed jam as well, which I neglected to photograph. Lisa L’s Broccoli Salad with cranberries, sunflower seeds and toasted almonds. I had this for my lunch the next day. Thanks, Lisa! 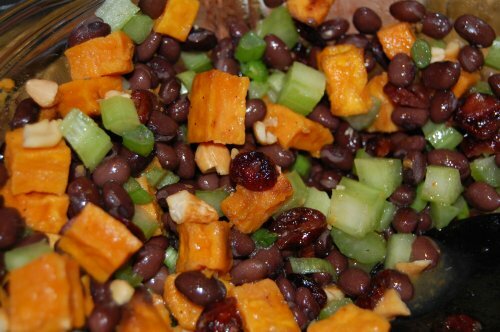 Charlie’s Black Bean and Chickpea Salad. A little lime thrown in for a Southwestern kick. Can you beat homemade beef stew with locally grown beef? Me thinks not. Did someone say parmesan cheese? 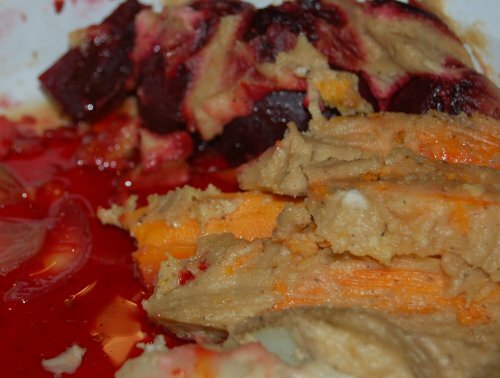 That was just one of the splendid things about Denise’s Baked Veggies Julienne in Phyllo. Judith’s Avocado Hummus Veggie Rollups. These were very tasty and would be great for summer picnics. So much amazing food! Please forgive me if I didn’t get everyone or if I’ve forgotten who made which dish. I get so distracted by all the goodies sometimes I just forget to write things down! Recipes coming on the next post. Until then, happy baking/cooking/eating! 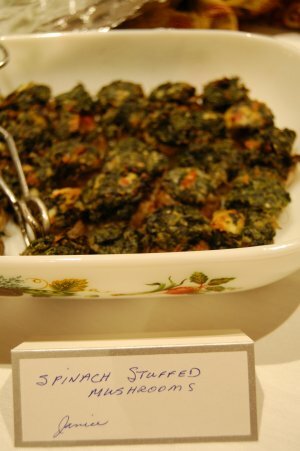 Things have been hectic and I am finally getting around to compiling the last of our recipes from our vegan meetup at the lovely resort last month. 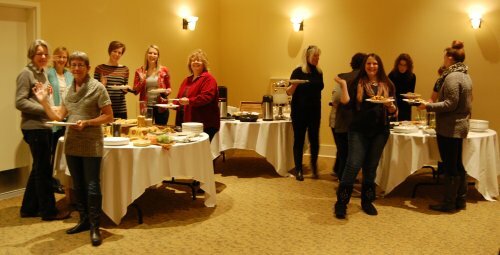 March 19 – Creative Indulgence Potluck, hosted by Artisans of the Okanagan. This event is totally open for culinary ideas, so make what you want – it doesn’t have to be baked. Think you can make it? Let me know! Now for more vegan goodies! 1 box frozen spinach thawed and pressed dry. 1/2 red pepper chopped very fine. 3 garlic cloves chopped fine. Or more depending on taste. 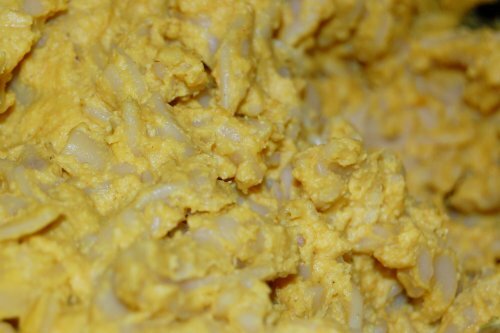 Grated cheese mixed with buttered bread crumbs for topping. To get everything chopped evenly, Janice used a food processor to do the pepper, onion, and garlic, and stems. My recipes are not written in stone anywhere, so these are only approximate measures. When in doubt, just experiment until you get the flavours and textures you like best. When in doubt, potaotes! 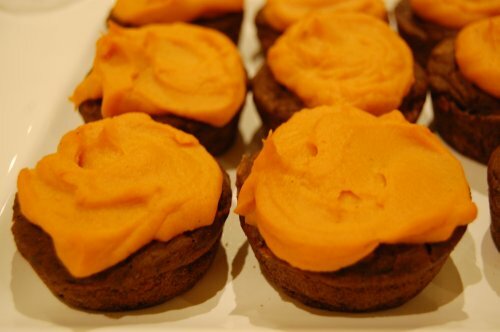 These wee treats were warming and a great comfort food – perfect for winter. 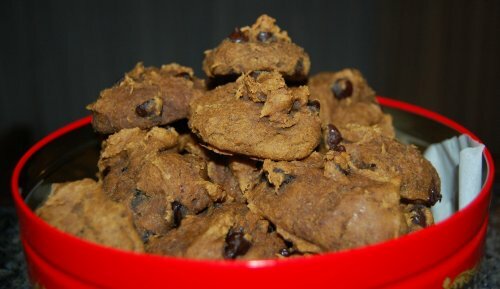 The recipe is from Allyson Kramer’s blog and is both vegan and gluten free. “They only have three ingredients,” says Lisa. Well, I will happily eat those three ingredients, if someone is kind enough to mix them together, bake them and bring them for me to devour. Yes, please! In fact, Lisa went above and beyond the call of the cake mix, taking an extra step to add chocolate chips. Find zee recipe here. I just about didn’t manage to get a photo of this before we’d eaten it all. 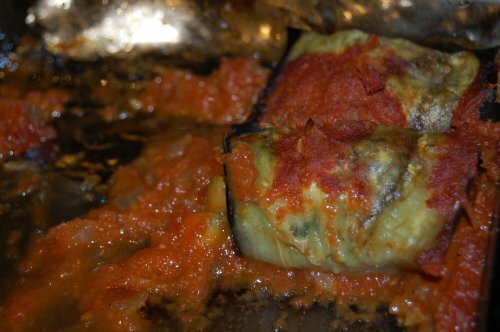 I had long since decided that I wasn’t a fan of eggplant, however I really liked this recipe. It’s very fresh and healthy and leaves you feeling like you’ve done something nice for yourself. 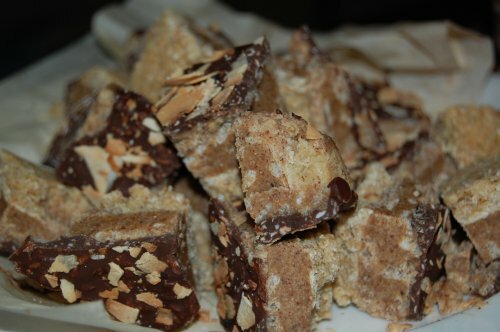 Below are more goodies we enjoyed, but I don’t have recipes for them and I can’t recall who made a few of them. I remember eating them with great happiness – isn’t that what counts? 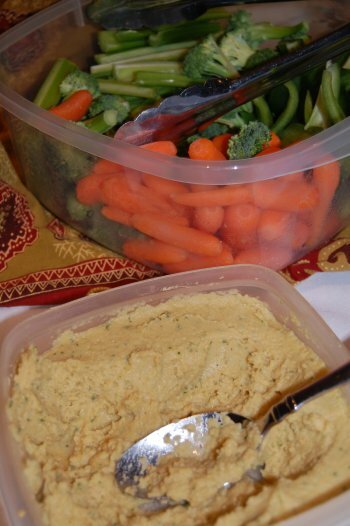 I know it was a vegan potluck but all I wanted to do was eat this with a piece of chicken. Nom. Wonderfully rich! Would be great with veggies or piled on baked mushrooms. Ah, hummus, the thing I’m always telling myself I should make more often because it’s just so tasty. If I have missed anyone or if you have a recipe to add, please let me know. Until next time, happy recipe planning! 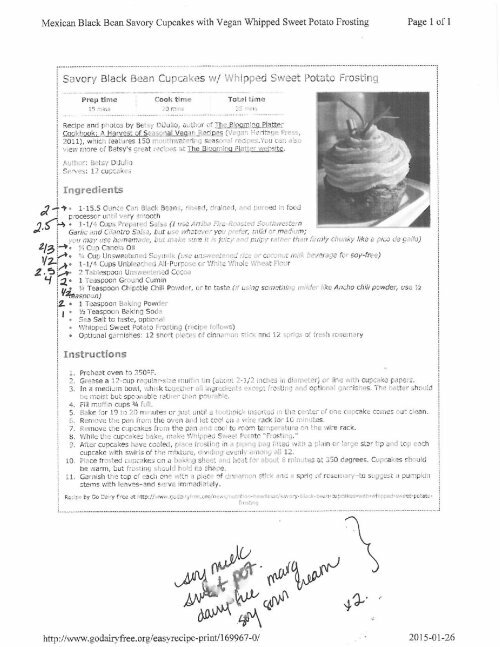 Once again I must start this post by saying that I know one of you gave me a piece of paper with a recipe on it. It was sitting on my kitchen table since vegan potluck night, and now it is not there. The pixies have taken it. Alas, I cannot guarantee the safety of any bits of paper when I am surrounded by so many goodies. My brain simply does not function as it should. So whoever was kind enough to give me that recipe, could you send it to me again? Thank you. Onward with the first of the recipes! One recipe I don’t have is the one for the stunning Mediterranean rice dish made by Ayman Kanaan. Ayman works with the resort and while he wasn’t able to attend our meetup, he still whipped up this amazing creation. It doesn’t even have a recipe because he flung it together. Yes, Ayman is made of awesome. But he is also a chef and we are amateur foodies, so we needn’t compare our also excellent goodies next to his professional offerings. We’ll just enjoy whatever food he feels like sharing with us. Any time. Whatever day of the week. Or weekends. Any of the meals of the day. Or light snacks. Anything at all. Okay. This is one of those recipes where my photo does simply not do it justice. 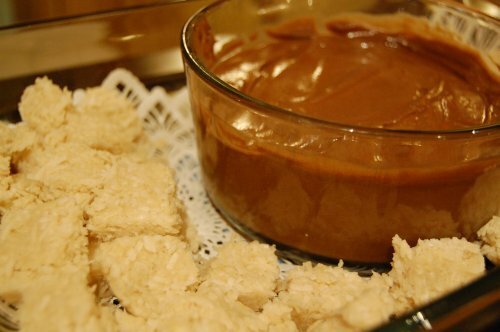 The little coconut bars were so delicious and went perfectly with the mousse. The following is the original recipe. I used a “Magic Bullet” and as given, the mixture is too thick for my blender. So I added extra maple syrup according to taste (for sweetness) and coconut milk (about a half-can) until I got the desired consistency. I’ve used almond milk in the past, so there are options for other substitutions. I used maple syrup and combined all the ingredients by hand, as I don’t have a food processor as recommended. The mixture seemed rather oily, so I added extra shredded coconut until the excess seemed to be mopped up. [For those of you who liked them, you are welcome to make the same mistake, otherwise it may be wise to leave the excess oil as a binder to keep the ingredients together when the oil solidifies again!] Once combined, press into a container and place in the fridge for a least an hour before trying to cut. (Or freeze for 15-30mins). Can be stored in the fridge or freezer, for at least a few weeks. Lisa wins the blue ribbon for most thoroughly interrogated recipe. Seriously, if her recipes were secret agents, Lisa would find a way to electrocute their ingredients until they gave up their agency contacts. Why go for the online version when you can reveal in Lisa’s improved one? Were these not delicious? Despite looking like they would take an extremely long time to make, I still want to make these because YUM. And of course the recipe is from Oh She Glows. Ah, yes -the cake I thought was meant for emotional eaters. Also known as Crazy Cake – are they trying to tell me something? Also, who knew there could be so many varieties of one cake? Alas my over eagerness for cake caused me to take a terrible photo, so you’ll just have to gaze at the online photos and imagine eating it again. 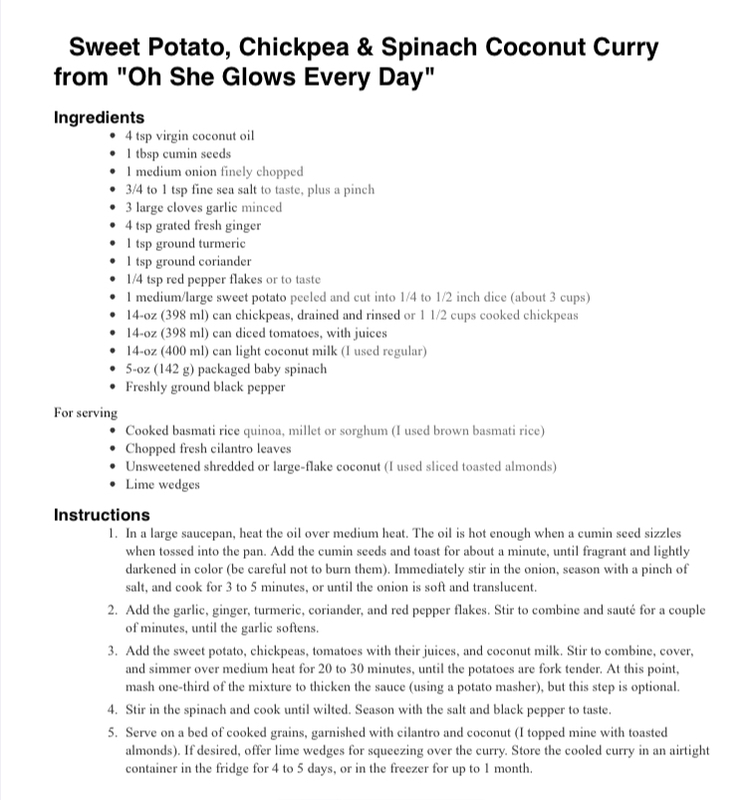 Yet another recipe from the Oh She Glows cookbook. I loved this sauce, but this is definitely eat it while it’s hot kind of dish. Not the best for leftovers as the texture completely changes once it cools. I loved these! 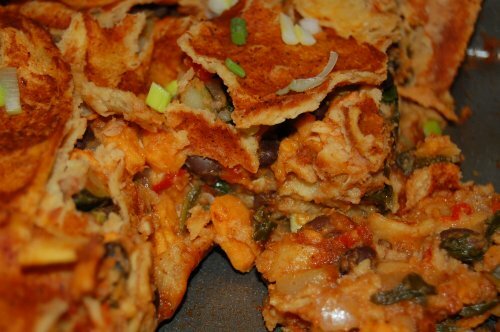 A great meatless option for if you have meat lovers in your family. It’s very Moorish and I doubt anyone would notice it is vegan because it’s just so tasty. Another Oh She Glows recipe? Could we have any more love for this site? 1. The selection was amazing! So many options, full of colour and healthy goodness. 2. We were EXTREMELY spoiled with our location. To all of those who missed our meetup at the Summerland Waterfront Resort, I’m afraid it’s unlikely we will be able to top that venue, possibly ever. I cannot top cutlery wrapped in plush cloth napkins, ice cold water pouring from an elegant glass dispenser, or TOWERS OF LEGUMES centrepieces, complete with charming LED candles. We won’t be able to rustle up a spacious ballroom with warm lighting, tasteful piped background music, and a movie screen descending from the ceiling on which to play a romantic foodie flick. They even had an amp to go with the projector. Indeed, we have been extravagantly overindulged and may be ruined for future gatherings. Of the dishes, there were black bean cupcakes with sweet potato icing, enchiladas, stuffed mushrooms, roasted veggies with cashew cream, macadamia nut “cheeze” dip, almond coconut bars, a grand Mediterranean rice dish, chocolate avocado mousse, hummus, roasted squash salad, and a “depression cake” that I thought was a cake that you were to eat when you were sad. Then I thought “Isn’t that all cake?” But actually it was called depression cake because it was made without eggs, something most people did without in the 1930s. I will share all the recipes next time. 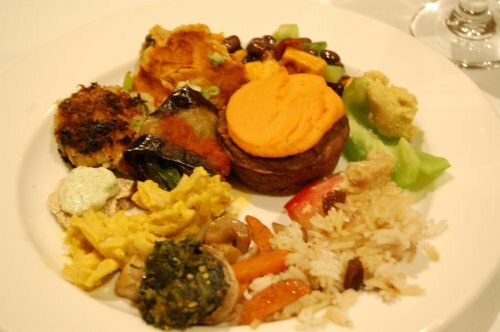 If you have a favourite vegan dish, please share it in comments! I know she keeps telling us to stop saying thank you, but I don’t care. THANK YOU to Lisa and the Summerland Waterfront Resort for spoiling us so very much. What an absolute treat.